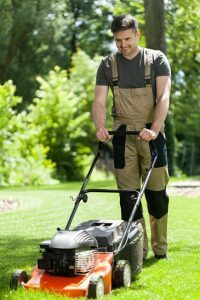 Eden farms offers weekly lawn mowing and string trimming services to make sure that your lawn is always looking well-maintained and healthy. String trimming is done on a weekly basis at the same time as the mowing operation. String trimming will be done to provide a clean, neat appearance to all areas adjacent to curbs, stones, driveway edges, buildings, around air-conditioners, etc. As mentioned, mowing is done on a weekly basis. However, poor weather may force us to reschedule and complete the service on a later date. The mowing height will be set at 2.5″ to 3.5″ unless drought conditions exist, at which time mowing height will be adjusted to avoid turf stress. Mowing equipment and patterns are employed to permit recycling of grass clippings to present a neat appearance. Excess clippings in high curb appeal areas will be removed. Papers, plastics, and other debris will be cleaned off lawn areas during the weekly mowing services as well.